Gas prices in Wailuku and Kahului on Maui were $3.55 on Thursday, according to the AAA Weekend Gas Watch. That’s eight cents lower than a week ago, 10 cents lower than last month and 31 cents lower than the same day last year. “The Energy Information Administration recently reported US gasoline demand at 9.6 million barrels. The last time the rate was this high was the 2018 Labor Day weekend,” said Liane Sumida, AAA Hawaiʻi general manager. 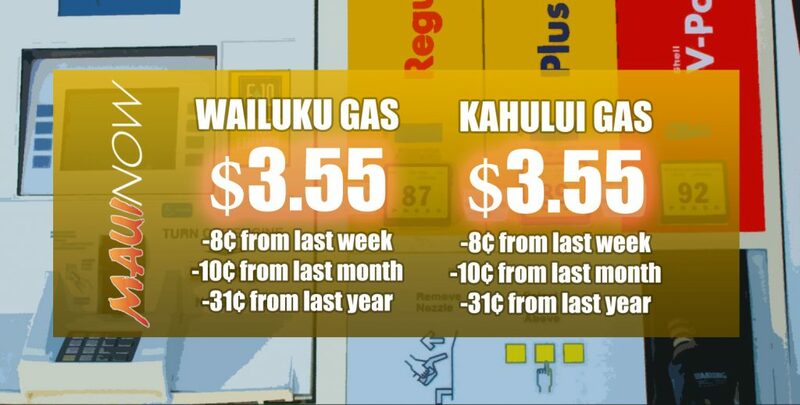 In Honolulu, Thursday’s average price for regular was $3.10, which is one cent lower than last Thursday, four cents lower than a month ago and 14 cents lower than at the same time last year. The Hilo average price was $3.32, up five cents from last week, three cents less than last month and 14 cents lower than a year ago. 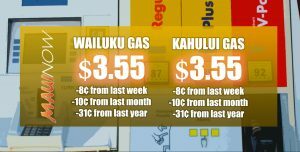 Līhue’s average price for regular was $3.50, down a penny since last Thursday, one cent lower than on last month and 13 cents lower than a year ago. The statewide average price was $3.26 a gallon, which is the same price as last Thursday, four cents lower than a month ago and 14 cents less than a year ago, according to GasPrices.AAA.com.